Markets have chopped sideways in the recent month and that's the least favorable environment for the reversal levels approach. But that doesn't deter us from staying in the big trending moves while avoiding big losses. Good trading starts with realistic expectations, so once a month we show the good, the bad and the ugly of our method. In March Global Blood Therapeutics GBT was topping our list. That move has ended and Petrobras Argentina PZE has taken over first place with a 102% gain in 80 days. The Buy signal was given on December 22 when PZE could be picked up at $5.74. It now trades at $11.63 and there may be more to come. 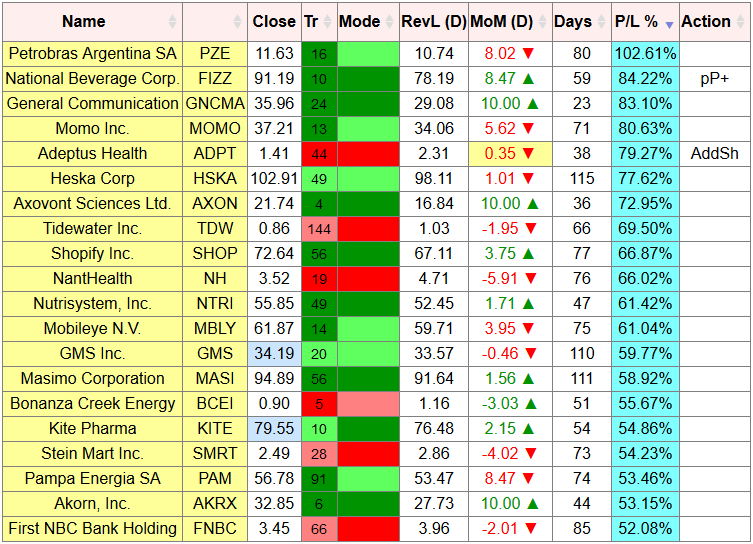 Second is FIZZ with an 84% gain in 59 days and GNCMA comes third after gaining 83% in 23 days. Those moves are not finished, stocks are held until their next Sell signal (or Buy signal for a short position). 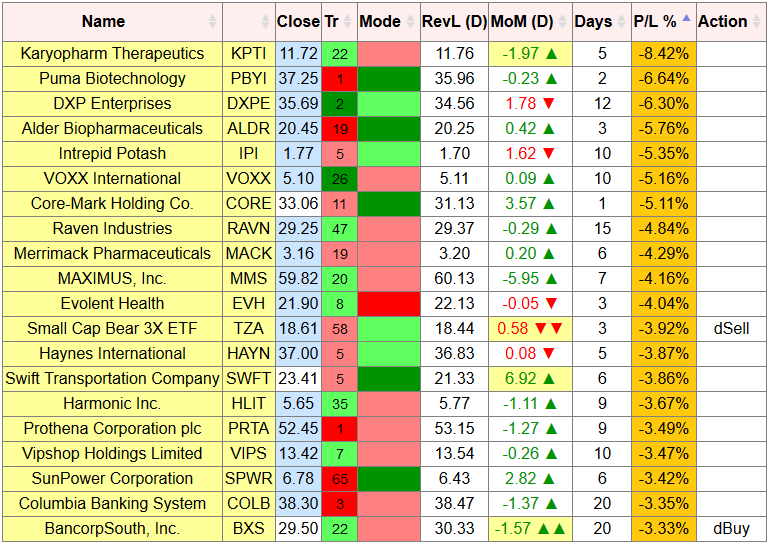 The current worst trades are short KPTI (-8%), followed by long PBYI (-7%) and long DXPE (-6%). We keep losses small. The weekly reversal levels do not change during the week. They are recalculated every Saturday based on weekly close. Buy/Sell signals are normally entered on Monday Open. Of course, nobody stops you from trying to get in at a lower price during the week with a limit Buy order. That's certainly a valid approach. It is not unusual for stocks to retest their weekly Revl in the weeks after a Buy signal, so putting your limit Buy price just above the RevL is a low risk strategy. The disadvantage is that some stocks will continue to climb right away, never giving you that cheaper entry.